Why not try biking to school this year? What a great way to get fit, do something as a family and reduce your emissions. 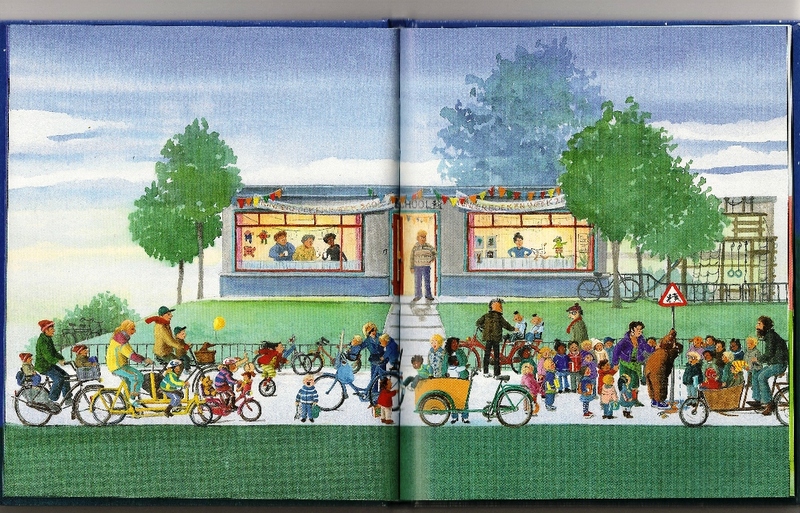 Photo: The children's book Fiets by Charlotte Dematons featured on Dutchindublin.wordpress.com. Forgive my few weeks absence from The List. I’ve been catching up on loads of work at Transition Voice, getting the kids off to school, and preparing for a busy fall season in the Transition Town group I help co-lead. But I figure, what with rogue earthquakes kicking up in odd locations and hurricane season dead upon us, it’s time to get back to encouraging conservation—those practices that will help deal with energy decline and, if done at a national level, maybe help fight global warming. In some lucky locations, school doesn’t actually start until after Labor Day, which is the “old school” way to do it. I advocate that. Kids just aren’t ready in the sweltering months of August to start focusing on sitting still and listening. If there were still butterflies and bees in the world, and kids still went outside, they’d want to be outside chasing them! Forgive my crankiness. I’m just more than a bit concerned about how off-track our society and culture is. But back to back to school. A friend of mine, Ivana Kadija (who I profiled during my Mother’s Day Series), is a school food activist, urging higher food quality standards in public schools, notably through a lessening of sugar in FDA school food guidelines. She’s leading an effort in Charlottesville, Virginia to improve food in the local school system. And while I sincerely applaud and support her efforts, particularly for how they may help poor students achieve better health, I also believe that packing from home is the best way to achieve a nutritious, low-waste outcome. It’s also a good way to minimize waste. Schools so often use styrofoam and disposable plastic cutlery, along with paper milk and juice cartons, leaving a mound of trash after every meal. Clean, non BPA lunchboxes (I like tiffins). Thermoses for drinks and soups. Small containers with lids, preferably stainless steel or non BPA plastic for side dishes. Reusable sandwich envelopes made of fabric or BPA and lead-free coated fabric. Reusable utensils in a keeper envelope. Forget buying pre-packaged snacks, even if they’re the so-called healthy versions. If your life is “too busy” to prepare your kids’ lunches, then cut something out of your life—you’re overloaded. But pre-packaged snacks are just a pipeline to the trash heap. And, as a general rule, provide little or no nutrition, too much sodium and way too many sugars. All that while costing much more. If you DIY, it’s cheaper and healthier and better for the planet and your local landfill. Things like Gogurt are patently offensive on the face of it. This is just copious waste for no good reason. What kind of people have we become when spooning yogurt into a reusable cup is beyond our capacity? Or when those 30 seconds, plus another for cleaning, just can’t fit into our day? Each and every one of us have to do our part to reduce our use of extraneous hard resources like paper, card board, and especially plastic. Teaching your kids now to use less, by packing their meals thoughtfully, is an important first step for our generation as parents. For their generation, it’s honestly a matter of future survival as the worst of energy depletion and climate change bears down on them. We have to give them a world worth inhabiting. That doesn’t happen by accident. It takes all of us to make that inheritance a reality.